As the Rev. Edward Pinkney approached the start of his second year in prison, a powerful show of support was displayed in Detroit on Dec. 12 for Michigan’s political prisoner. The Emergency Conference to Save Rev. Pinkney drew over 70 participants from across Michigan and several other states. Longtime supporters of Rev. Pinkney were joined by many who had only recently heard about the jailed Benton Harbor civil rights activist. Many were meeting each other for the first time. Attorney Tim Holloway, Rev. Pinkney’s appeals lawyer, exposed the wildly unconstitutional procedures used by the prosecutor, Michael Sepic, and allowed by Berrien County judge, Sterling R. Schrock, to get the all-white jury to convict Rev. Pinkney despite having, admittedly, “no evidence” linking him to the charges of altering five dates on a mayoral recall petition. 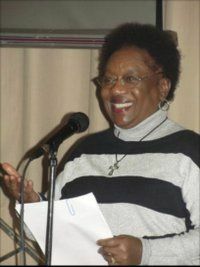 Longtime supporter and organizer Marcina Cole linked Rev. Pinkney’s ordeal to the regime of racism, police misconduct and mass incarceration of African Americans across the country. A call to elevate the profile of Michigan’s political prisoner in the media nationally and internationally was made by Abayomi Azikiwe, a leader of the Moratorium NOW! Coalition and the Michigan Emergency Committee Against War and Injustice. He reported that radio shows had recently given substantial coverage to Rev. Pinkney in San Francisco, Milwaukee and Washington, D.C. The Final Call newspaper and CounterPunch online magazine have also given coverage to this case. Regular coverage of the struggle to free Rev. Pinkney is found in Workers World newspaper and the People’s Tribune. A widespread campaign was launched to show support for Rev. Pinkney and let Marquette Prison officials know that they are being watched by many. People are being urged to send a holiday greeting card to Rev. Edward Pinkney #294671, Marquette Branch Prison NE-93, 1960 U.S. Hwy. 41 South, Marquette, MI 49855. A table at the conference had dozens of holiday cards laid out so people could sign them or send a brief message on the spot. An open microphone allowed widespread discussion. A woman who explained that she was a dues-paying member of Amnesty International let people know she was pressing the London headquarters of AI to take up Rev. Pinkney’s case. Lamont Lilly from North Carolina, the Workers World Party candidate for vice president in the 2016 national elections, promised to raise Rev. Pinkney on the campaign trail as he travels the country. A young autoworker, Tom Michalak, reported on important trade union support coming for Rev. Pinkney. A taped message of support was shown from the Baltimore People’s Power Assembly. In the days following the conference, an important development emerged that may add to the efforts to keep Rev. Pinkney safe from vindictive and racist prison officials at the remote Marquette prison. Several Michigan state legislators, pressed by their constituents, have agreed to contact the Michigan Department of Corrections director to express their concern for the health and safety of Rev. Pinkney. They also have approached the legislative corrections ombudsman to ask him to look into the concerns that Rev. Pinkney has expressed about abusive treatment. It is hoped that such inquiries will, at the very least, make officials more cautious about how they treat this embattled political prisoner. Calls to the Michigan legislative ombudsman, Keith Barber, expressing concern for Rev. Edward Pinkney, #294671 at Marquette Branch Prison, can be made to 517-373-8573. PayPal donations to help finance the defense of Rev. Pinkney can be made online at bhbanco.org.